(Phys.org) —Ernesto Gianoli and Fernando Carrasco-Urra, researchers working in Chile and Argentina have discovered a truly unique plant—Boquila trifoliolata—a vine native to the area that the research pair has discovered, is able to mimic multiple hosts—a first for the plant world. In their paper published in the journal Current Biology, the duo describes the vine and its unique attributes. Many examples of mimicking exist in the animal world, with some specimens able to mimic multiple hosts. Less common is mimicking in the plant world, especially when it's on-demand. Many plants have evolved to look like other plants, but very few are able to change the way they look when the need arises, and until now, no plant has been known to be able to do so with more than one plant (mimetic polymorphism). B. trifoliolata is a true exception, it can change the shape, size and color of its leaves, and can even do so to mimic several other plant types, at the same time—it is a true chameleon. The researchers suggest the special abilities of the plant have evolved as a means of self preservation. They found that the same plant living on the forest floor had a 33 percent greater chance of being eaten by a passing herbivore, and those living on trees had it worse, there was a near 100 percent certainty that they would be eaten. In being able to change on they fly, so to speak, the plant exhibits near animal capabilities, able to grow its leaves to ten times their normal size. It can even change the vein patterns in its leaves to match those of the host, demonstrating an ability that was until now, believed impossible in plants. The vine has its roots in the ground and like other vines, climbs up and onto other structures, be they trees, bushes or even human made structures. As it does so, it takes on the characteristics of the tree it's using as a host, masking itself from those that would eat it. Presumably, the vines are able to somehow "choose" their host, as climbing onto a plant that animals eat wouldn't help much. The researchers have no idea how the vines do what they do, though they guess it might have to do with an ability to detect odors from the host, or even microbes that live in them, triggering gene-activating signals in the vines. Being highly sensitive to Poison Oak, I tend to obsess over the plant. I've noticed over the years that Poison Oak appears to mimic plants it is growing with. 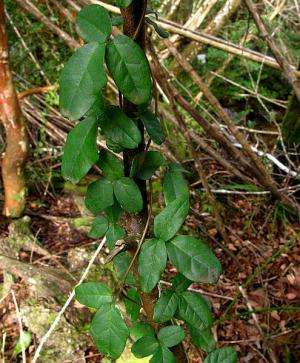 And it normally looks a lot like this Boquila Trifoliolata. If I saw Boquila Trifoliolata here, I would definitely think it was Poison Oak. But animals do not normally eat Poison Oak, so that would not be a good explanation for the need for Poison Oak to mimic another plant. This article has inspired me to renew my quest to document the mimic abilities of Poison Oak.